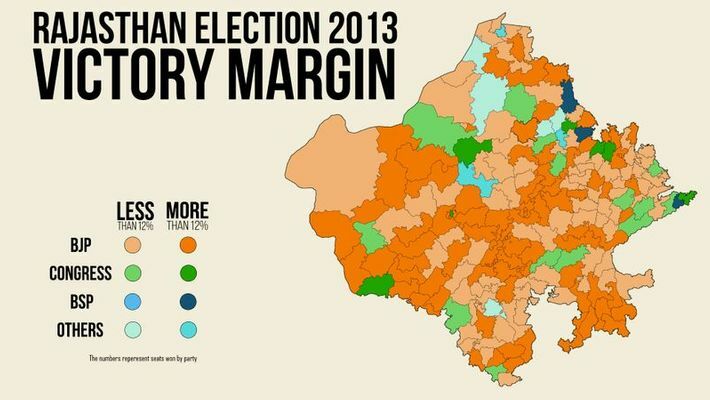 In 2013 Assembly elections, the BJP had secured a massive mandate by winning 163 out of 200 constituencies. The BJP further consolidated its grip over Rajasthan in the 2014 Lok Sabha elections when they bagged all the 25 seats from Rajasthan. While the Congress had lost only 3 percentage points in vote share between 2008 and 2013, the BJP had gained 12 percentage share in votes in the same time. BJP’s support in Rajasthan comes mainly from upper castes and upper classes. In 2013, upper caste Rajputs have supported the BJP since the 1990s partly because of their strong Hindu associations. In 2013, a post-poll survey suggested that 67% of Rajputs voted for the BJP. The BJP also scored resounding victories in SC/ST-reserved seats. Of the 58 SC/ST seats, they won 49 and secured 45% of the votes.